A few months ago, we wrote a post about recovering a forgotten restrictions passcode. That got me thinking about other popular passcodes that don't have a built-in recovery mechanism. Then a customer emailed me that they forgot their Photo Vault passcode! It turns out that the Photo Vault passcode is stored in the backed up preference files, and it's easy to get out of an iPhone/iPad/iPod backup. 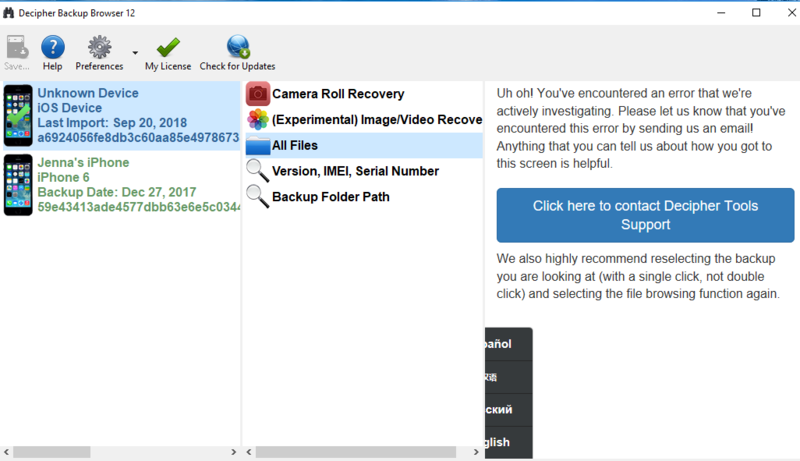 The free trial of Decipher Backup Browser will allow you to recover your Photo Vault PIN. You don't need to purchase a license code to recover the Photo Vault passcode. Download Decipher Backup Browser and make a backup of the iPhone with the Photo Vault PIN/passcode you need to get. Select "Photo Vault Passcode" from the center column. Your Photo Vault PIN will show in the right column. Was the Photo Vault app installed on the iPhone at the time that the backup was made? And, was the backup finished in iTunes at the time you ran Decipher Backup Browser? Hello Kelly, I have been trying to recover my 4 digit password of photo vault PIN. Please help me retrieve it. After backing up my device and following the below instructions I got as no PIN stored. Followed by the below feedback. We hope you appreciate full access to your Photo Vault passcode within the free trial of Decipher Backup Browser. * Is the backup you're looking at from an older iOS device or from a current one? * Was the photo vault PIN set up in the app at the time this backup was made? Thank you very much for the response Ma’m. 1. I’m actually not looking for a back up. I’m using iPhone 7 with the latest OS. I have actually forgotten my PIN of photo vault. All though I have the app right now but I cannot access it because of forgetting the PIN. I have not added the recovery email as well. 2. No the photo vault PIN wasn’t set up at the time of backup made. I hope you will try to resolve my issue and help me retrieve my password. I will be very much thankful to you. Please! I'd like to make sure I understand the situation properly though. Is Photo Vault on your iPhone now asking you for the PIN? Or is it a fresh install with no PIN set up? It sounds like it's a fresh install with no PIN set up, but in that case, it's not clear to me where you would use the old PIN? Thanks again! The situation right now is I’m being a user of photo vault App since so many years. And it’s not a fresh install. I have more than 4GB of files in it. I forgot my PIN which I changed before 6 months. Now, the files are available and I cannot access just because I forgot my PIN. I need your help to retrieve my PIN. I'll be following up via email with a debugging version of Decipher Backup Browser shortly so we can dig in a bit to the underlying issue. Also, do you see a "Photo Vault Folders Passcode" section in addition to the Photo Vault Passcode section in DBB? If so, are there passwords listed in there? Yes, I could see the photo vault pass code section and it is mentioned as NO PIN STORED. Just followed up with you via email with a new version of the program to try. Should show the PIN set up in the latest versions of Photo Vault. As my email says as well, this new location requires the iTunes backup to be encrypted. Downloaded the browser. I even paid for it. This is for an iPad. I don't see the photo vault or photo vault pass code anywhere. Please see my picture. 1) If the backup is still going in iTunes (or was still going in iTunes) when you ran DBB, try DBB again now that the backup completed. what if i forget the password for the app itself? there is any way to get it back?